“Should I get the HTC EVO or the iPhone…?” “The Samsung Galaxy Epic 4g or the Droid X…?” Those are the famous last words that usually end in a bloody fist fight between fans of both sides. But, what about the facts? Have you seen the Smartphone Comparison chart in the groovyPost forum? When I was deciding what phone to buy that thing was a life saver! I think someone at Google picked up on the idea, because that is just about exactly what the new Google phone gallery is. The Nexus one was Google’s pride and joy, the flagship of the Android fleet. But despite Google’s web marketing attempts, it didn’t quite take off – most people bought the Droid or G1 instead. The Nexus one was always readily available for purchase at google.com/phone, and this week the Nexus one was given the boot to make room for ALL of the phones in the Android family. 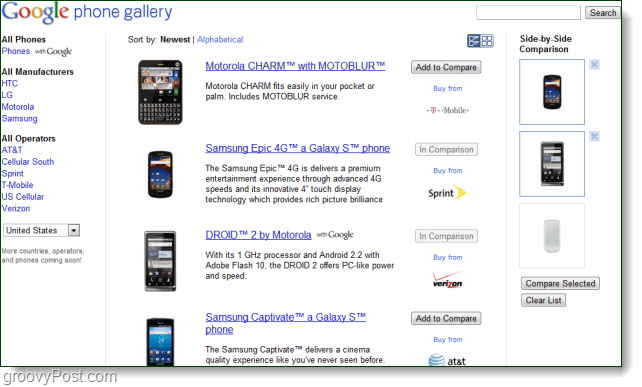 The new /phone site of the Google empire is like an online comparison shop for all Android phones. You can sort by carrier, manufacturer, and country. It is really simple, and it’s a groovy way to know educated yourself before signing up for a 2-year contract or buying a $500+ phone. Do you have an Android phone? Which one? Tell us below in the groovy comments!